In June 2015, the volume of loans to the economy (excluding interbank loans) recorded 14 884.8 mln. GEL, which exceeds by 32.6 % the corresponding indicator in June 2014. 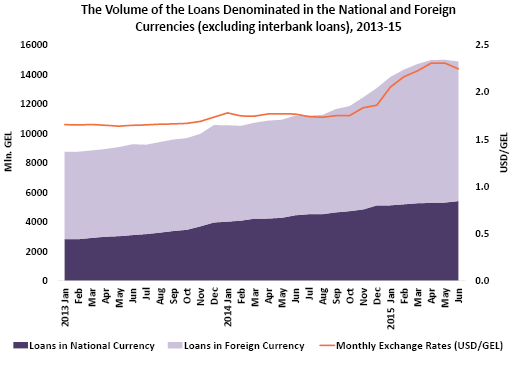 The volume of the loans denominated in national currency increased by 21.5 %. The volume of the loans denominated in foreign currency in USD increased by 10.2 %, while in GEL – by 40.0 %. This difference is due to the fluctuation of the foreign exchange rate. In June 2015, the average interest rate on the loans denominated in foreign currency is 11.5 %, which is the same as the indicator of June 2014. In this period, the average interest rate on the loans denominated in national currency declined (-0.8 % point) and recorded 18.4 %.